This 2005 report launched Public Impact’s research on the cross-sector evidence about what makes turnarounds successful. Despite decades of efforts to support teachers with coaching, most teachers still do not get the support they need in their own classrooms. Yet most teachers, including experienced ones, need support to continue to evolve professionally, hone their practice, and use new tools. This support is most powerful when offered routinely and on the job by skilled professionals. In Coaching for Impact: Six Pillars to Create Coaching Roles That Achieve Their Potential to Improve Teaching and Learning, from Public Impact, Learning Forward, and the University of Florida Lastinger Center, the authors use the research on coaching and their forward-looking analysis to call on the nation’s education leaders to expand their commitment to high-quality coaching for all teachers. 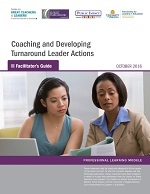 The report outlines six pillars essential to creating meaningful coaching roles along with recommendations for those responsible for creating and supporting results-oriented coaching programs. State and district leaders have a chance under ESSA (the 2016 Every Student Succeeds Act) to use their new funding flexibility to take a new approach that focuses on excellence for teachers, and students. This brief and one-page executive summary explain four opportunities to go beyond the requirements of ESSA to achieve a culture of excellence, one that attracts even more talented educators, keeps them for long careers, and helps them excel. Read the related opinion piece by Emily Ayscue Hassel and Bryan C. Hassel on Real Clear Education. In the most successful Opportunity Culture schools, principals lead an instructional team of multi-classroom leaders. Other principals can emulate their approach using this set of tools, which helps principals plan for and lead a schoolwide team, along with tools for principals new to an Opportunity Culture school. Authorizers and support organizations can use the School Restart Authorization Process Guide and related database to increase the success and sustainability of restart interventions in low-performing schools, with step-by-step guidance for designing or refining the restart process. The guide’s recommendations are based on the experiences of authorizers, school operators, education support organizations, and community leaders with experience in restarts nationwide. The process guide is complemented by the Restart Authorizer Resource database, with searchable tools and resources collected from authorizers and support organizations. These resources offer practical examples of the materials that support each step of the restart process. The restart process guide and authorizer resources are available at www.schoolrestarts.org.